News choppers no longer disturb the early morning quiet and in their place dozens of colorful hot air balloons soar silently above our back deck. The coffee is on, the kids are still asleep and the paper is on the front stoop . Must be a normal Sunday morning in downtown Napa. Except the neighbor’s electricity is still off, a new rash of red tags has invaded the area and I just noticed a an empty space on the kitchen wall. One of my framed vintage citrus crate labels must have been swept up in the shards of glass and china that covered the kitchen floor this time last week. I guess I just didn’t see it had fallen until now. Trivial and minor compared to what some people are missing. 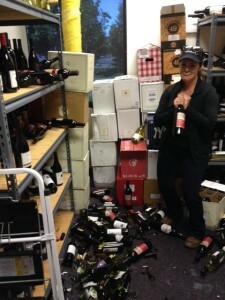 In last week’s 6.1 earthquake we lost a lot of glassware, dishes and mirrors. We have neighbors who lost a whole lot more. Especially now that the news crews are gone, it’s important to keep attention on the plight of those worse off than many of us are. Though some think of Napa as a posh playground for the privileged, it takes a lot of regular folks to keep it working, and many of them live right here downtown in the area hardest-hit by the quake. As in so many disasters, it is the least who can afford it that are suffering the most. Below is a list of ways you can help, even if you don’t live in the area. -Over 95% of Napa Valley businesses, restaurants and wineries are open. Downtown Napa is passable, functional and open for business with any damaged buildings marked off. Your dollars help support the dishwashers, servers, cellar workers and tasting room staff that keep our world-famous wineries and restaurants going. Over 95% of businesses in Napa are open. Here is a list of places still closed- check back frequently! -Coordination for volunteer labor is being done by the Volunteer Center of Napa, which is operating out of Grace Community Church at 3765 Solano Avenue, Napa CA. Call the center at 707-252-6222. -Show support for your favorite Napa winery by buying a bottle– or three! Besides shopping downtown, you can always buy products from local businesses online. -Lucero Olive Oil suffered much inventory damage during the quake and though they are now re-opened, show some support by buying a bottle online. -Matthiasson Family “Quake Cuvee” Blend. All after-tax profits from sales of this special blend will be going to the above relief fund. Jill and Steve suffered particularly hard losses in wine inventory, as well as damage to their house, which was red-tagged by the city. 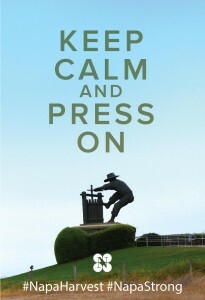 -Napa Valley #PressOn T-Shirt. Wear your hashtag on your sleeve and profits will go to the Community Disaster Relief Fund. There are many ways to contribute funds that will stay local and will go directly to the community’s needs. Additionally, there are some business and individual-specific initiatives that could use your help. -Napa Valley Community Disaster Relief Fund. 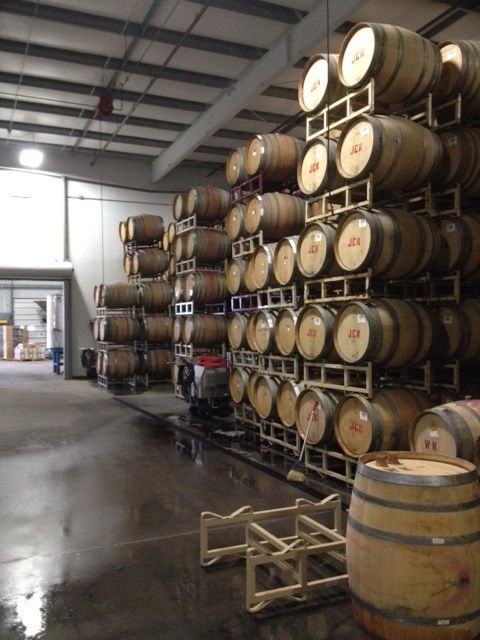 The Napa Valley Vintners generously contributed $10 Million in seed money to kick off a disaster relief fund. Contribute to it here. -Napa Chapter of the Red Cross. According to the City, donations made to the local chapter will be kept here. -Napa County Landmarks, donate here. Many of our historical buildings suffered significant damage and it will take love- and money- to rebuild and retrofit. -Napa County Humane Society, donate here. Many people have lost pets due to the quake and the Humane Society can use funds for sheltering and feeding recovered pets. -13-year old Nicholas Dillon was almost killed when his family’s fireplace collapsed on his back, shattering his pelvis. Contribute to his medical care fund at Bank of America: Nicholas Dillon: savings account 1641-0344-2511. 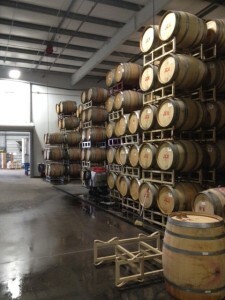 -Jason Moore of Modus Operandi started a “Go Fund Me” site to help feed and support the many Napa Valley volunteers who have been working around the clock to remove broken barrels and debris from area businesses. You can see some cool pictures and video taken by one of my favorite winemaking professors, Dr. Carole Meredith, at the Lagier Meredith Vineyards Facebook page. I encourage you to give them a “like”! -Sala Salon’s “Go Fund Me” site: Sala Salon, Napa’s Aveda hair and spa boutique, suffered catastrophic water damage after the quake and is closed. They even imported a fully functional mobile salon from Hollywood in an attempt to stay in business and the city inexplicably red-tagged it so that is shut down too. With bills to pay and employees to support, they are asking for a short term “loan” to help ends meet until insurance kicks in. Once they are back on their feet, all monies raised will be funneled into the Napa Valley Community Disaster Relief Fund. Click here to help them stay afloat and meanwhile, sign the online petition to remove the red tag from the “Sala Annex” trailer so they can keep serving the community. Thanks for your help. A lot of people are without jobs and without homes and your assistance will help get them back on their feet. 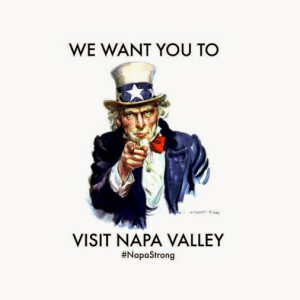 #DrinkNapa and stay #NapaStrong, everyone! I am not affiliated with any of the above organizations and don’t endorse one charity over another. Like you, I hope that donations made are appropriately allocated.